There are things that could be improved, such as smartphone notifications supporting third party apps, waterproofing would be very much welcomed, and some data could be more accessible. Overall though, the Charge 2 is a brilliant activity tracker that succeeds its predecessors successfully. If you liked the Charge HR, you'll love the Charge 2. The Fitbit Charge HR was the fitness tracker to beat in 2015. It wasn't only one of the best from the company - which also makes the Ionic, Blaze and Alta trackers - but one of the best dedicated trackers with heart-rate monitoring from any manufacturer. Now it's been replaced by its successor: the Fitbit Charge 2. With a new design and extra features, does it make the best Fitbit even better? We've been living with one to find out. The Fitbit Charge 2 can still be recognised as a Charge device, although it has quite a few changes compared to the Charge and Charge HR. For starters, the Charge 2's display is four times larger and it sits on a solid, stainless steel body like the smaller Fitbit Alta HR. The result is a lovely looking device, as far as activity trackers go. On the underside of the display is where you'll find the PurePulse heart-rate monitor, along with the clips for swapping-out the 21mm-wide textured elastomer strap for another available option. The straps are fastened with a stainless steel buckle, just as the Charge HR was, which feels secure and comfortable on the wrist. At times, we found it a little tight when trying to ensure it was in the optimum position for reading our heart rate, but it's easy enough to adjust. The stainless steel body gives the Charge 2 an air of premium about it and the chamfered edges look great. There is a button on the left-hand side, as there was with the previous Charge devices, though it is now larger. There are several colourways too, including plum and silver (as pictured), black and silver, blue and silver, and teal and silver. In addition to these four standard options, there is also a lavender and rose gold option (our favourite, hands down), a black and gunmetal option, as well as the extra leather straps. The larger OLED display on the Charge 2 is easy to read, with text appearing crisp. It makes the Charge 2 look that little bit more exciting than its predecessor, too. The display is bright, but there's no way to turn the brightness down. So wearing the Charge 2 to bed is like having a torch shone in your face if you wake up and lift your arm and activate the display by accident. That brightness means it's great in sunny conditions though, so we won't complain too much. We found the lifting of the arm to wake the display a little temperamental too. It didn't always work, except when we were sleeping, when of course it worked every time. Like the original Charge, tapping on or below the display presents various pieces of data or options. This worked well in our experience and it was sensitive enough to ensure you didn't have to bash the device too hard. What's new in the Charge 2 are additional smartphone notifications. These originally came in the form of incoming calls, texts and calendar alerts, which is more than the original Charge's incoming call alerts. Text notifications didn't work brilliantly for us in the Charge 2, probably because no one really texts us and third-party apps weren't supported at the time of review so no iMessage or WhatsApp notifications appeared. If you do receive texts, you can opt to see just the sender name or the name plus the message. The Fitbit Charge 2 carries over all of the features found on the Charge HR. So you get heart-rate monitoring, plus steps counted, distance travelled, floors climbed, calories burned, active minutes, and sleep. In addition to these, the Charge 2 introduces Connected GPS, meaning it uses your phone to provide map and route data. It also offers Multi-Sport tracking, a feature that was introduced on the Fitbit Alta, allowing you to record several sports - including as running, cycling or yoga - and see the real-time stats on the display. There are 13 sports to choose from in total, seven of which you can select to appear on the Charge 2's display through the Fitbit app. To start tracking one of them, you'll first need to find the activity on the device, then hold the button to the side of the display to start tagging it. Overall, the process of tagging an activity is much more fiddly than it was on the Charge and Charge HR, and a lot more complicated than it needs to be. 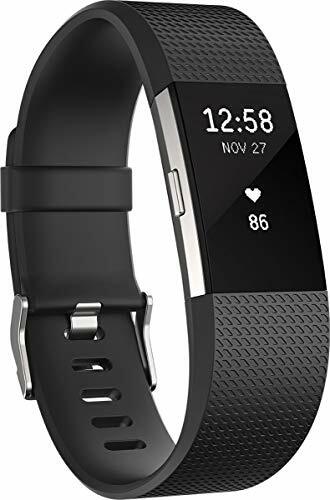 Automatic exercise recognition is also present, which does what it says on the tin: the Charge 2 will record certain exercises after 15 minutes, transferring the data to the Fitbit app and, just like with the Alta HR, the Charge 2 has reminders to move too. The Charge 2 isn't waterproof like the Fitbit Flex 2, Fitbit Ionic or Withings Activite Steel HR so you can't take it into the pool, but it does introduce two new features: Cardio Fitness Level, otherwise known as VO2 Max, and Guided Breathing. The Cardio Fitness Level feature gives you a personalised fitness score over time based on your resting heart rate, as calculated from you wearing the device to sleep, along with information it collects from a 10-minute run you need to do with Connected GPS. This information, coupled with your height, weight, age and fitness data is then compared to other users of a similar age and gender to give you your score. Guided Breathing provides personalised breathing sessions based on your heart rate where you are required to breathe in accordance with the circles on the Charge 2's display. There is the choice of a two-minute or five-minute session, though we'd recommend the former as five minutes is a long time to watch a circle move in and out and try and make your breathing match it. In terms of performance, the Fitbit Charge 2 is great at step tracking and sleep tracking. Based on our experience, steps were within a couple of what we physically counted, while sleep tracking was accurate to the minute on the times we woke up during the night. Occasionally it got the times we woke up in the mornings a little wrong, but for basic sleep tracking, it's good. Heart-rate monitoring is also pretty good, though sometimes a couple of beats lower than it should have been when exercising, while resting heart rate seemed a little high at times. We wouldn't recommend using the Charge 2 for HR-focused training - but if you're after a ballpark figure then it does a consistent enough job. It's much harder to test the accuracy of VO2 Max and we aren't sure we'd trust any wearable to give us a completely on-the-mark reading, though the feature is nice to have. Calling it Cardio Fitness Level makes it less daunting and more consumer friendly. Battery life on the Charge 2 is also impressive, lasting around six days, though it's annoying there is no indicator on the display, requiring you to open the app to check instead. Like the Alta HR, the Charge 2 is charged with a special charger that clips onto the device, connecting with the pins underneath the display. It charges quickly, but it is another cable to carry around if you travel and are away for more than a few days. As is always the way with Fitbit devices, the app and interface is one of our favourites. It is simple, effective and easy to navigate. There are five tabs at the bottom of the Fitbit app, comprising Dashboard, Challenges, Guidance, Friends and Account. There is also a "+" in the middle, which offers quick access to things such as tracking an exercise, logging food, adding a friend, setting an alarm and logging weight. The Dashboard is the main element, offering a summary of your day, including steps taken, distance travelled, calories burned and active minutes, all of which can be rearranged by tapping on Edit in the top right hand corner. It also has tiles for weekly exercise, heart rate, sleep, weight, water intake, and food intake. A tap on each of the metrics will give you a rundown of your history for that particular element. However, there are a couple of features we'd like to be more easily accessible, or more obvious. For example, to find your Cardio Fitness Level, you'll need to tap on the heart rate tile, then swipe the graph at the top to the left. Swipe a second time and you'll be taken to the minutes in heart-rate zones graph. This is one of the things we'd like to be more obvious as the information is really quite useful. Tagged activities, which are found in the weekly exercise tile, should also be more obvious. In the top left-hand corner of the Dashboard, there is a small picture of the Charge 2 along with the battery indicator. A tap on this will launch the settings for your tracker - including options like which hand you're wearing it on, which clock face you want, what you want your main goal to be, and what you want Charge 2 to greet you as. You get the jist. This is also where Smart Notifications can be toggled on or off and where reminders to move can be tailored. Within the Guidance tab, you'll find the Fitbit Coach and a few challenges, while in the Challenges tab you'll find specific challenges to keep you motivated, as well as an Adventures feature. This enables you to explore destinations by working towards a different step goal every day, which is based on your seven day average. There are several Adventures to choose from, such as a 3.1-mile walk around New York that requires you to take 8,000 steps. As you step, you unlock the sights and landmarks. The Account is the last tab but also one of the most important. It is here you can edit your profile, change your goals, link third-party apps such as MyFitnessPal, and alter things such as stride length for better accuracy. There's a lot to love about the Charge 2. It takes the best features from the Fitbit Charge HR and Alta, while adding a few more including VO2 Max and Guided Breathing. It also takes on Fitbit's new design ethos with interchangeable straps, solid build quality and a larger, informative OLED display. There are things that could be improved, such as smartphone notifications supporting third-party apps, waterproofing would be very much welcomed, and some data could be more easily accessible. Overall, if you're looking for a well-designed, accurate fitness tracker with a fantastic app platform, then the Charge 2 fully takes charge.